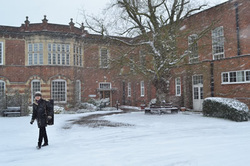 The Purcell School > News > Uncategorised > Snow and Swing dancing. Pressures of time have prevented any posts recently, so I shall make up for it today with an extra-long one. The snow fell in abundance last week, and students made the most of it with snowmen, snowball fights, and ice slides. However, I think we’re all bored of it now and hoping the thaw will come soon. The photo shows how lovely the school can look when covered in the white stuff. Today, as a bit of light relief from exams, students were initiated into the fun of Swing Dancing – i.e. dancing to music from the Swing Era. This included the famous Lindy Hop, which proved a challenge for some. Back to Mocks tomorrow, though.